JavaFX 8 comes with two new classes, SortedList and FilteredList. In JavaFX 2 we had to manually do the filtering as I’ve described in an earlier post. So, let’s see how we can use the new classes to sort and filter a TableView. As an example we’ll create a simple table that displays Persons. The table should be filtered whenever the user enters something in the text field. The example contains four files. You can look at each file individually or download the entire source as an Eclipse project. We will only take a closer look at the PersoTableController as this is where the sorting and filtering takes place. For the sorting and filtering to work, we need to wrap an ObservableList in a FilteredList and then in a SortedList. * View-Controller for the person table. * Just add some sample data in the constructor. * Initializes the table columns and sets up sorting and filtering. // 0. Initialize the columns. // 1. Wrap the ObservableList in a FilteredList (initially display all data). // 2. Set the filter Predicate whenever the filter changes. // If filter text is empty, display all persons. // Compare first name and last name of every person with filter text. return true; // Filter matches first name. return true; // Filter matches last name. return false; // Does not match. // 3. Wrap the FilteredList in a SortedList. // 4. Bind the SortedList comparator to the TableView comparator. // 5. Add sorted (and filtered) data to the table. To allow filtering we must wrap our masterData in a FilteredList. The FilteredList filters the list depending on a specified Predicate. The initial Predicate is always true: p -> true (yes, this is a Java 8 lambda expression). As a second step we add a ChangeListener to the filter text field. Whenever the user changes the text, the Predicate of our FilteredList is updated. In this example I’m using a filter that matches whenever firstName or lastName contains the filter String. FilteredList is unmodifiable, so it cannot be sorted. We need to also wrap it in SortedList for this purpose. A click on the column header changes the sorting of the TableView. But now that we have a separate SortedList we must bind the sorting of that list to the TableView. Notice that the TableView will return back to the original, unsorted state after three clicks on the column header (this was not the case in JavaFX 2). As a last step we set the sorted and filtered data as items into the personTable. 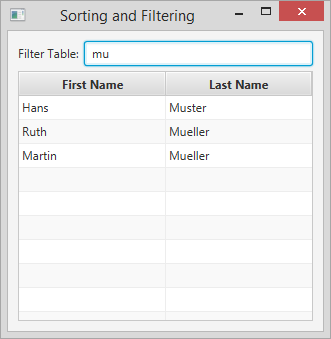 Sorting and filtering has become more convenient in JavaFX 8. But not everything is straight forward: double-wrapping a list, binding a Comparator, and creating a lambda expression inside another lambda expression are things that are not all too common.